An artist’s concept of two kinds of monolayer atomic crystal molecular superlattices. On the left, molybdenum disulfide with layers of ammonium molecules; on the right, black phosphorus with layers of ammonium molecules. 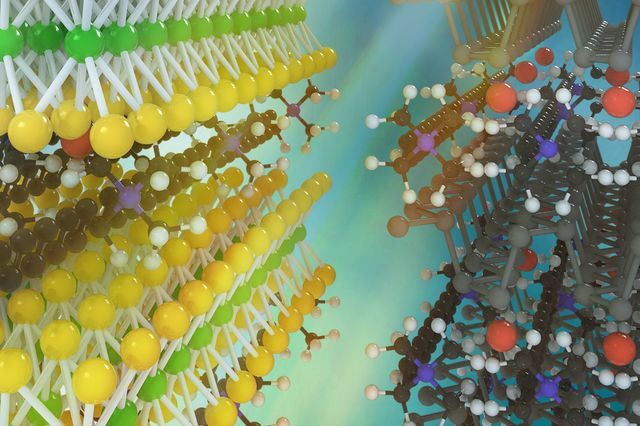 A research team led by UCLA scientists and engineers has developed a method to make new kinds of artificial “superlattices” — materials comprised of alternating layers of ultra-thin “two-dimensional” sheets, which are only one or a few atoms thick. Unlike current state-of-the art superlattices, in which alternating layers have similar atomic structures, and thus similar electronic properties, these alternating layers can have radically different structures, properties and functions, something not previously available.